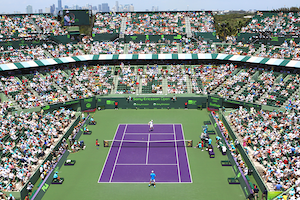 Three time Miami Open and holder of 20 majors Roger Federer struggled today in his opening match. Still, in the end, the Swiss put away qualifier Radu Albot 4-6, 7-5, 6-3 to move on to the third round at the Miami Open. Playing someone for the first time can be a tricky, Federer dropped the opening game of the match and could not bank on any of the four break points he manufactured. Consequently, Albot, who secured his first ATP tile this year in Delray Beach, grew in confidence. 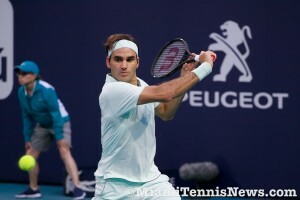 Federer finally capitalized on break point in the second set to push the match to a third set. Once again, in the last set, one break point in Federer’s favor was the difference. Stanislas Wawrinka, Federer’s countryman, was not as fortunate. The three time major champion fell in the day’s initial match to Filip Krajinovic 5-7, 6-2, 7-6 spoiling the all Swiss third round collision. Wawrinka led in the tiebreaker 5-2 and lost the next five points. Other notable upsets include 9th seed Marin Cilic who went down to qualifier Andrey Rublev 6-4, 6-4. Tenth seed Karen Khachanov was sent packing by Australian Jordan Thompson 6-2, 6-3. American qualifier Reilly Opelka stunned 21st seed Argentine Diego Schwartzman 6-4, 3-6, 6-4. While 20th seed Denis Shapovalov squeezed by lucky loser Daniel Evans 4-6, 6-1, 6-3. Also, moving onto third round are Kevin Anderson who toughed it out against Jaime Munar in three sets. Grigor Dimitrov had no trouble with Feliciano Lopez. The Bulgarina dismissed the Spaniard in 60 minutes, 6-1, 6-3. Eighth seed Stefanos Tsitsipas, 13th seed Danil Medvedev, Leonardo Mayer, 18th seed David Goffin and Joao Sousa booked their bid into round three in straight sets. Following a first round bye, Roger Federer, a three time champion comes out for his initial match in the new home of the Miami Open. The Swiss will clash with qualifier Radu Albot in the afternoon. This will be their first encounter. Beforehand, Federer’s countryman, 3 time Major champion Stanislas Wawrinka kicks off the day session in stadium court. Wawrinka collides with Serb Filip Krajinovic. The two have yet to play at this tour level. Other players who will be displaying their talent as they fight for a place in the third round include 2019 Australian quarterfinalist Stefanos Tsitsipas, 2 time major semifinalist Grigor Dimitrov, 2014 U.S. Open champ Marin Cilic and American hopeful Australian Open quarterfinalist Frances Tiafoe.